Today we all went out to the school wildlife garden to let our butterflies free. We all crowded around the net to say goodbye. We don’t think that the butterflies wanted to leave us! They crawled on our hands and we had to gently let them crawl onto the bird table, after a while they got used to their new home and fluttered off in to the trees. We all enjoyed watching them grow from tiny caterpillars. 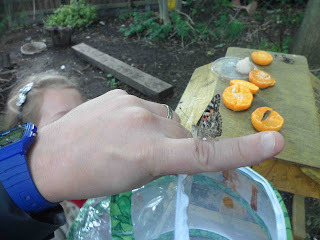 One of the butterflies crawls along Mr Littlewood's finger.